Last week I was finally able to release to astro-ph my latest paper on red quasars to the public. I had hoped it would become a press release and for a long time it seemed quite possible, but it was not meant to be. However, it will become a web feature on the Spitzer website, so be on the lookout for it on September 20th or so. I’ll make sure I’ll link it somewhere on the webpage. Anyway, the paper had been submitted for a long time now and it was also accepted in July, but since the “press status” was not clear, I held it back. It itches in your fingers to yell to the world about it, but I guess everybody feels that way about their work. So, the gist of the paper? Well, boys and girls, gather ’round and hear the tales of the quasars, how they grew to be so luminous in the centers of their galaxies… Last time we left you in the company of these 13 young lads (AGN or quasars as their fellows called them), they were seen to be discovering how they came to be. Their traced their birth back to the merger of two galaxies (seen in Hubble ACS observations), the instability of the two being able to funnel material to the center and ignite the black holes. Since the quasars were still obscured to some degree by that material it was easier to discern the hosts and their merger features such as tidal tails and such. Nevertheless, even accounting for that obscuration, the host galaxies seemed more disturbed than usual. In fact, there was a faint (!) correlation between the amount of obscuration/reddening and the disturbance of the hosts – a fact that we interpreted for them to be young quasars, not established like the unobscured quasars we know. There were other clues, like the X-ray slopes and high Fe complexes, implying large accretion rates or a large fraction of BALs and blueshifted OIII lines, implying winds emanating from the quasar. So with those observations we were awarded Spitzer time. The main driver was to disentangle the different IR contributions, the cold-ish (30-200K) star formation from the host from the hot AGN contribution (3000K). The spectra would also allow us to see if we saw any PAH complexes (seen in regions of star formation) or Silicate in absorption (seen when the dust doing the absorption is cold). So with all the spectra and photometric points, we were able to fit different models to them and gauge the contribution from each one. See the pic on the right for an example on how such a modeling works. The dots are all the photometry points we have along with their uncertainties (SDSS, 2MASS, WISE, MIPS) and the line is the IRS spectrum. 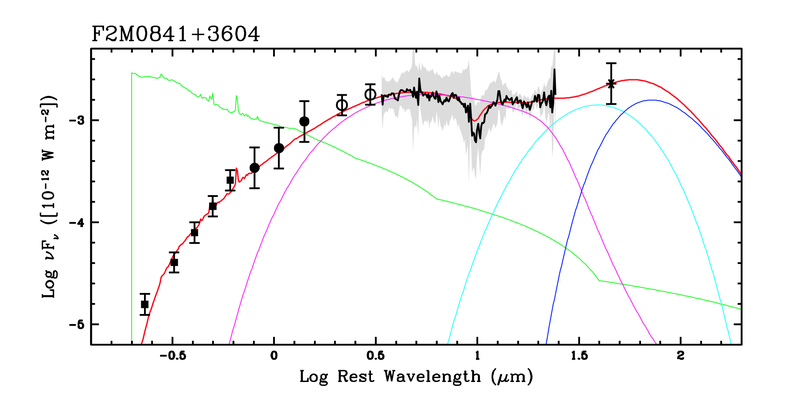 The red thick line is the best fit model and the others just signify the different contributions from all, the light and dark blue lines, for example are tracers of star formation. Once we were able to disentangle the AGN from the host, we could finally get the true bolometric luminosity of the quasar. Correcting for obscuration, we were also able to get the black hole masses of the quasars, too. Phew, lots of info, but with all that data (HST, Spitzer, IRTF, Chandra, Palomar and Keck), we now had all the ingredients to make the following assertions. a) Our quasars are much more obscured by COLD dust than normal quasars. They are not Type 2s, which don’t show Silicate in absorption that much. This confirms the Hubble images and previous Chandra results showing much higher dust:gas ratios than normal. In fact there isn’t ANY of our quasars that shows Silicate in emission, something that is quite frequent for broad line AGN (which ours are). b) The quasars affected by Silicate in absorption are also more likely to be accreting at a higher rate, with the most active slurpers having Super-Eddington accretion rates. These also show signs of blueshifted OIII lines, indicative of winds. These were also the systems showing high disturbances (though that is quite a weak correlation, as it was in the 2008 paper). c) The highly accreting systems are below the M-L relation (mass of the black hole relates to the bulge luminosity – the so-called Magorrian relation). This is whether you count the total host after PSF subtraction or the fitted bulge – they are WAY below (see title picture!). Young quasars are undermassive in relation to their host luminosities, so in a sense they need to “catch-up”. The ignition of star formation precedes quasar activity. d) Unfortunately, one thing we were not able to prove was any correlation with star formation rates. Most of the quasars had hosts with luminosities in the LIRG regime (10^11-10^12 solar luminosities), which signifies star formation rates of about 10-100 solar masses per year, but there was no rhyme or reason behind which galaxy got to form more stars. Oh well, not everything can fit into a nice little story. This is my first post on my blog, but it definitely entails a few things I’ve always wanted to vent out into world during my astronomy career. It was sparked by a post made by a postdoc into the facebook astronomer group that she was “quitting astrophysics”. In the post she sounded off about the field brutal and contributing little or nothing to science. Of course the work-life balance issues, especially relating to young mothers came up, albeit as a PS. It garnered quite a lot of feedback, most of it sympathetic and I will talk about the problems we have in astronomy a bit in this post. However, I will reserve my views about women in astronomy (kids, two body problem, etc.) for a later discussion, so as to not clutter up my train of though in this post. So, a job in astronomy… yep, it’s hard to get. There are about 10,000 professional astronomers in the world give or take a few thousands depending on your definition of astronomer. Looking at it from that angle, of course it is difficult, there are far more people interested in astronomy in the world than the 10,000. Collegetimes actually took this argument ad absurdum and published it under “The 11 hardest jobs to get in America“, because there are only about 50 (tenure track) positions advertised every year. Of course, being president of the United States also ranks as “profession” in their list and herein lies the point. There are some professions in this world that pass as dream professions for some. Many kids want to be professional athletes when they are small, but the ones that actually make it are few and far in between. My daughter at the moment wants to be a rock star / dancer. I do think astronomy is at the boundary of those dream professions, in that for some it’s a dream, they wanted to explore the Universe ever since they were kids and for others they kinda slipped into it during the later years of their studies. This is why the facebook post irked me so much. The second sentence read: “I find the astronomy world to be a brutal place where dreams go to die.” It has been quite the opposite for me, actually and it is the dream aspect that has been keeping me going (along with encouraging words from mentors and friends, of course). I can always count on astronomy, the idea of learning about the Universe, to keep me going when it gets tough (when the 7th proposal is rejected in a row, when the paper is going nowhere, when you feel there is no job out there for you, …). Videos like this or this make me feel privileged to be part of the endeavour of finding out our place in the Universe and how it came to be. The times when I see the wonder of my students looking through a small telescope or just saying “whoa!” when they got a concept on the blackboard remimd me that I came from the DREAM side to this profession. And the dream is what keeps me going! But enough about ranting about what makes astronomy so great, otherwise I would never shut up. Let’s get to the bad part. Unfortunately, if you want to someday hold a secure position working in research in astronomy you will have to compete with a lot of people that hold that dream and have already overcome many steps and challenges to get to vie with you for that position. The numbers are roughly the following (this is from memory from an AAS presentation from about 3 years ago, I’m only paraphrasing): Roughly speaking for every qualified applicant, there is a postdoc position. however, the position might not be the position you were originally looking for, so roughly the ratio of *willing and enthusiastic* applicants per position is about 2:1. I don’t know if that is good or bad, scary or not, but it certainly leaves me scrambling on the rumor mill pages during upcoming job seasons a lot – even with a job, heh! The situation becomes bleak when it comes to permanent positions, the ratio rises to about 4:1 and even 10:1 when it comes to top tier research schools tenure-track positions. Those are some daunting odds that rank right up there with Hubble Observing time success chances. Would you be willing to set your personal life with all that it entails (moving, partner, kids, friends, “stuff”…) for a 10:1 shot? One that isn’t even guarateed to work out (you get denied tenure)? One where you feel that it is a closed club to enter, so why even bother to try? I don’t know what your answer is to these questions. For me it was something different in that the questions were kinda worded wrong. 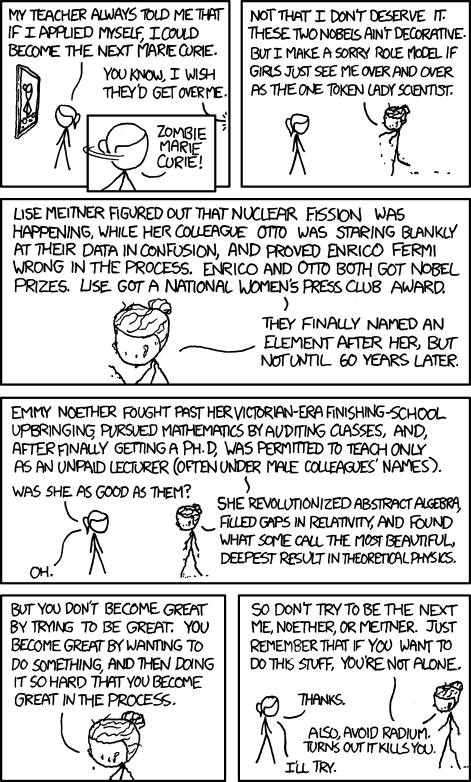 In the facebook thread somebody mentioned Cecilia Payne-Gaposchkin’s quote on the matter and I felt in summarized my feelings on the matter perfectly: “Do not undertake a scientific career in quest of fame or money. There are easier and better ways to reach them. Undertake it only if nothing else will satisfy you; for nothing else is probably what you will receive. Your reward will be the widening of the horizon as you climb. And if you achieve that reward you will ask no other.” The reward is not to sit in a nifty professor’s University office, the goal is your research and I’m glad I’m part of it.